These are the two cars every other car aspires to be. The Maruti Suzuki Swift and Hyundai i20 combine to form more than 60% of this segment’s share and coming anywhere close to them is more than a dream for any other car in this segment. So it was impossible for us not to put them against each other and figure out which one outsmarts the other one. Hyundai, along with its subsidiary Kia, is the 5th largest automaker in the world, and their 2014 collective sales target is 8 million units. What is more commendable here is Hyundai’s journey in India. From the boxy and not-so-cool-looking Santro to the Elite i20 – thanks to the fluidic design philosophy it has embraced. The interiors of the Hyundai Elite i20 are just top notch. The attention to detail is surprising, and while there are more hard plastics than you’d like – the overall quality of the cabin is very impressive. Not only is it comfortable, light, and airy, but it also has every single gizmo you can think of – 1GB of internal memory, Bluetooth streaming, great sound quality, multi-function steering, sunglass holder, climate control, rear AC vents, push-button start, reversing camera, and probably even an ice cream maker hidden in the cooled glove box. The ride quality of the Elite i20 is simply sensational – there’s no other way to describe it. The suspension setup is near perfect – not only does it provide a compliant ride over any surface at any speed, but it also feels completely surefooted while doing so. Another niggle we experienced in the past were the brakes – which, under hard braking, would lock up initially before the ABS engaged and sorted things out. The 90 horsepower diesel engine is carried over from before, and while it has been tuned a little for drivability – which means that it’s extremely tractable and linear in its power delivery – it’s never going to set your pants on fire. The steering, unfortunately, is still as distant as ever – so the Hyundai i20 is never going to involve you in the driving experience. Everything in this car is still as smooth as butter, right from the way the gear lever glides from one gear to the next. The clutch pedal is light enough to pamper your left leg – but there isn’t an automatic available incidentally! It’s completely planted at 150km/h. But it’s just better at looking after you, and syncing your smart phone, than it is at getting properly stuck in! Now here is the big daddy of all the hatchs here – the Maruti Suzuki Swift. A car that completed 10 years in India very recently and, if all goes as planned, can rule the market for another 10. Keeping up with the pace and time, Maruti Suzuki launched the third generation Swift in the Indian market sometime around October last year. 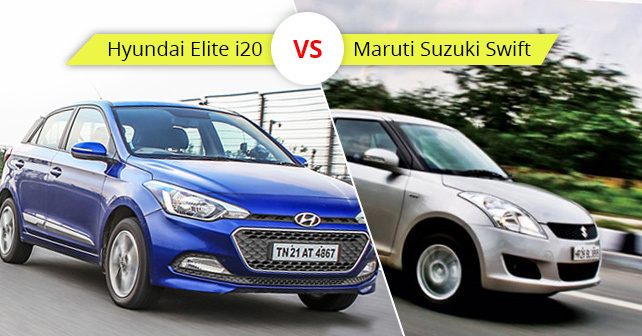 So, it made all the more sense for us to compare the Hyundai Elite i20 and the third-gen Maruti Suzuki Swift to figure out if the new generation has anything new in it or not. The look of the new Swift is nothing too distinguishable from its predecessors, but the car still brings you smile every time you sit in the driver’s seat. It is probably the best package this segment has to offer, but it also does make you think of things this car could have been. Because, Suzuki sells the Swift Sport in Europe, which boasts of a 1.6-litre petrol engine that produces over 130 horses and slightly tweaked suspension. Personally, I think we would have loved that car way more than the present Swift, which we had for our Maruti Suzuki Swift Review, but it seems that the Indian audience is not enough mature to fall in love with a car like that. The chassis of the Swift is so willing, it’s so playful, and it’s so engaging that it makes the perfect platform for a hot-hatch. At the BIC, the car we had for our Maruti Swift Review made full use of the excellent mid-range torque produced by this very familiar engine. The steering is quick and precise, but a little less communicative as before, the gear shift is as predictable, yet pleasing, as ever – which is to say very much so – and the chassis is as happy as a Spaniel to be scurried around the BIC. The engine is the usual 1.3-litre diesel unit with 4 cylinders and 16 valves. It still produces the same 75bhp of power as it did before, and the lag is easy to live with. There is nothing too flashy about the car in terms of driving, but the standards have been set so high by the previous versions that it is impossible to surpass them any further. The car stays planted in all the situations thanks to a chassis that is made to perfection. The power is delivered to the front wheels via a five-speed manual transmission, and the 190Nm of torque is enough to pull the car out of any situation. It’s kind of tough to decide a winner here. How can you choose one car from a lot which comprises of a car that has been ruling the Indian roads from last 10 years and another car which is scaling heights at a rate never seen before in the Indian market. The Maruti Suzuki Swift looks old and needs a serious revamp, the Elite i20 is a car that is surely ahead of the competition. The car is new in every way and doesn’t look like another facelift version.